The sunny weather is coming which means food festival season is beginning. Huzzah! 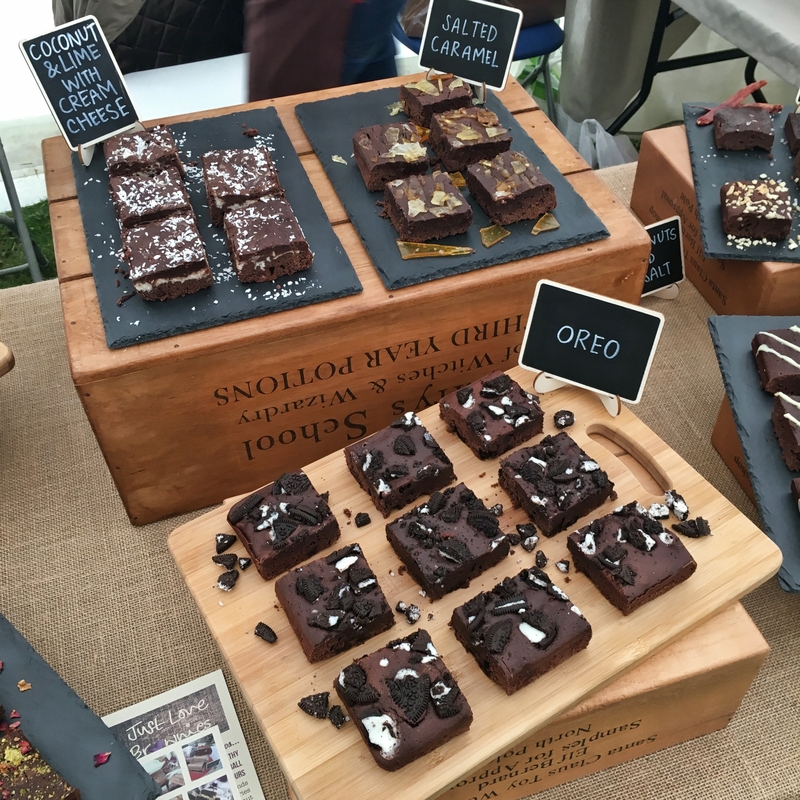 Food festivals are a glorious thing, namely because of all the food and drink on offer, but also because you get to find brands and meet new people that you wouldn’t normally discover and I highly recommend all you foodie lovers go to one. 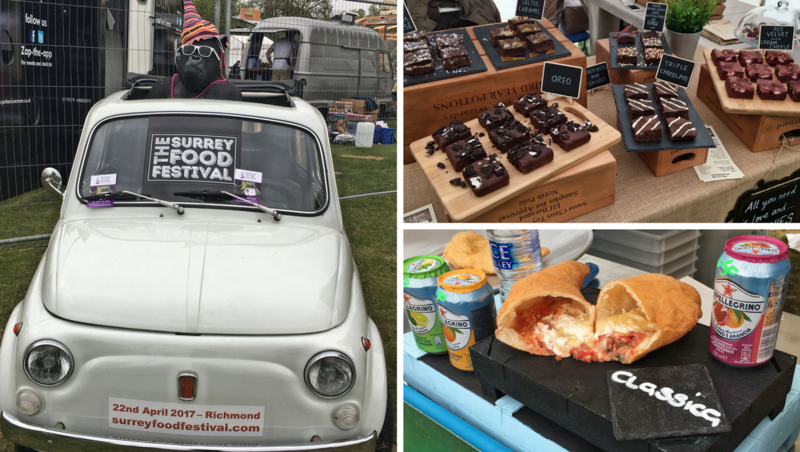 Kicking off the food festival season for me was Surrey Food Festival which was situated in Old Deer Park in Richmond. If you are following on Instagram you will have seen many delectable delights at the weekend and got the inside scoop on Instastories. Despite the debacle of the sat nav taking us on one epic journey, we finally made it and the grey sky just about held out. Unsure whether it would be all outdoors or not, the layout was thought out with the food and drink trucks situated like a bull ring broken up by the entertainment stage, kiddie rides and giant marquee which was home to the Marketplace. From Top: The Duck Truck Duck Wrap. Na Pizza Fritt, The Podgy Pieman. There were plenty of things to eat and if you fancied it you could make quite the day out of it. From the most obvious burger and hot dog to the more adventurous curry, BBQ, Caribbean, crepes, waffles and churros, two things caught my eye. Na Pizza Fritt which in a nutshell is a Neapolitan Calzone fried instead of baked, which I imagine is one hell of good hangover cure, and The Duck Truck duck wrap which I was so happy to see again I had to have another because seriously these wraps are the stuff dreams are made of! 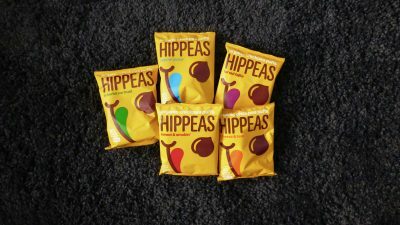 Where there is savoury there is sweet. Mostly fixated on baking there were the most gigantic flapjacks from Flapjackery I have ever seen with an even smaller price tag, marshmallows, macarons, fudge, brownies and cupcakes. And if that isn’t your thing well there was plenty on offer to drink, and by drink I mean alcohol and the Gin was certainly winning it there. From Top: Marshmallow Heaven, Gorilla Spirits Co. 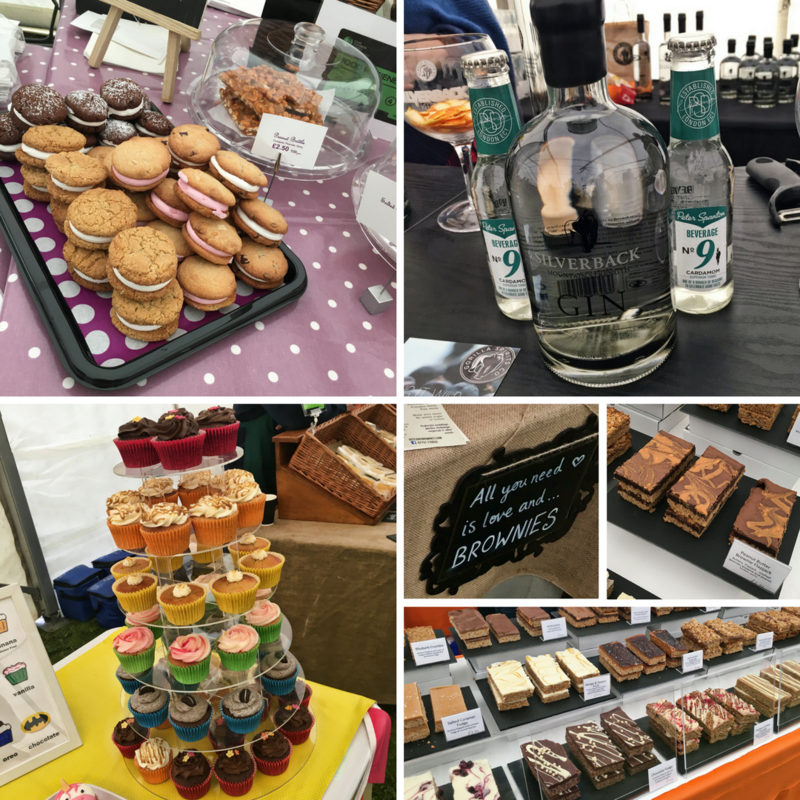 Gin, Esme Baker Cake Maker Cupcakes, Flapjackery. If I had got everything that made me go ‘oooo yum’ I would be both well out of pocket and well on the way to adding to the waist line. I could however not resit the cupcakes from Esme Baker Cake Maker, they were gorgeous, look at those unicorns. 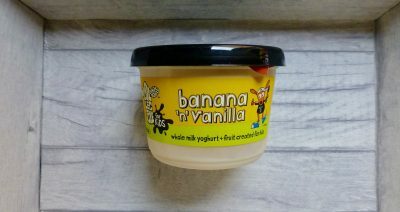 FYI they were delicious, Banana and Oreo were my fave. 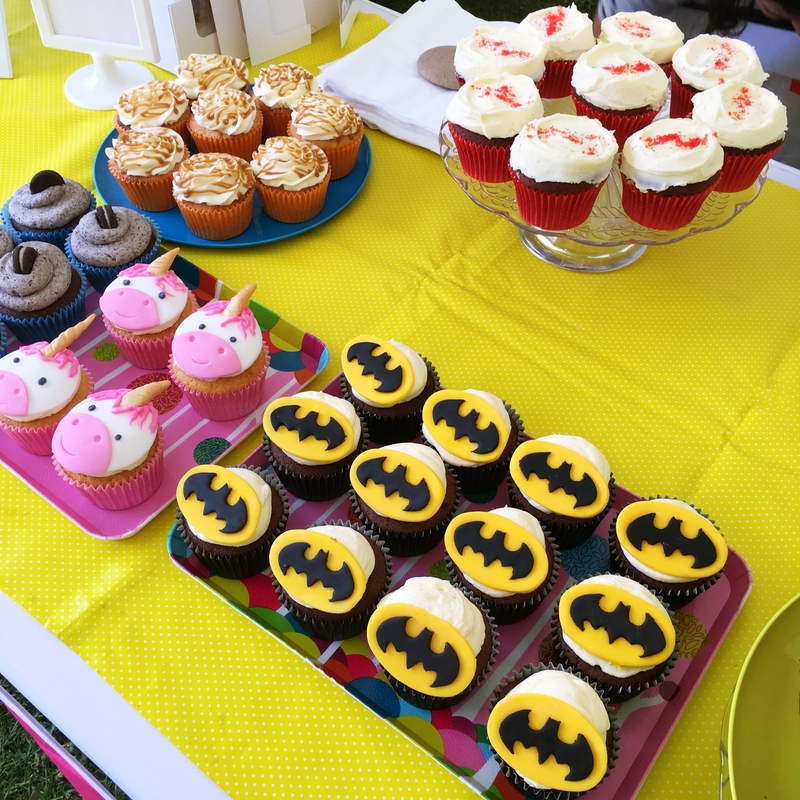 Esme Baker Cake Maker – Red Velvet, Salted Caramel, Oreo, Unicorn and Batman Cupcakes. 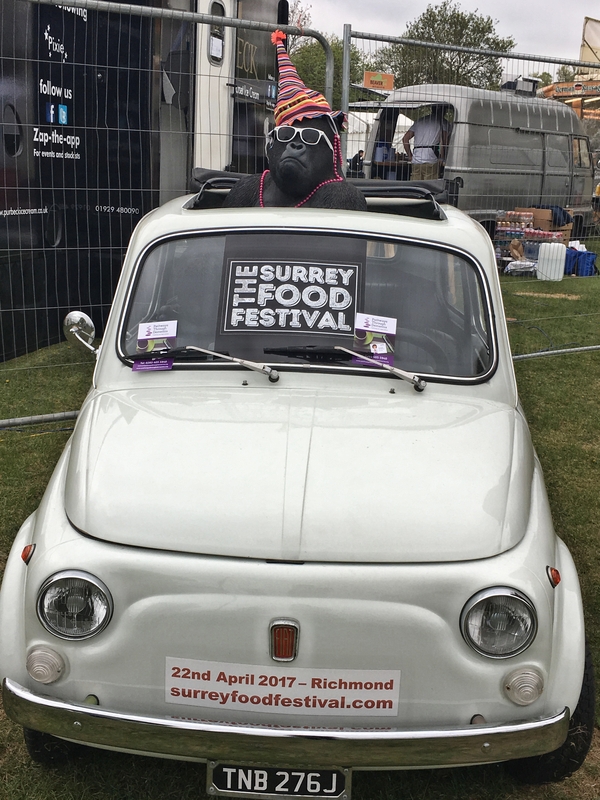 I thoroughly enjoyed my morning out at the Surrey Food Festival however I cannot help but feel the balance just missed the mark. 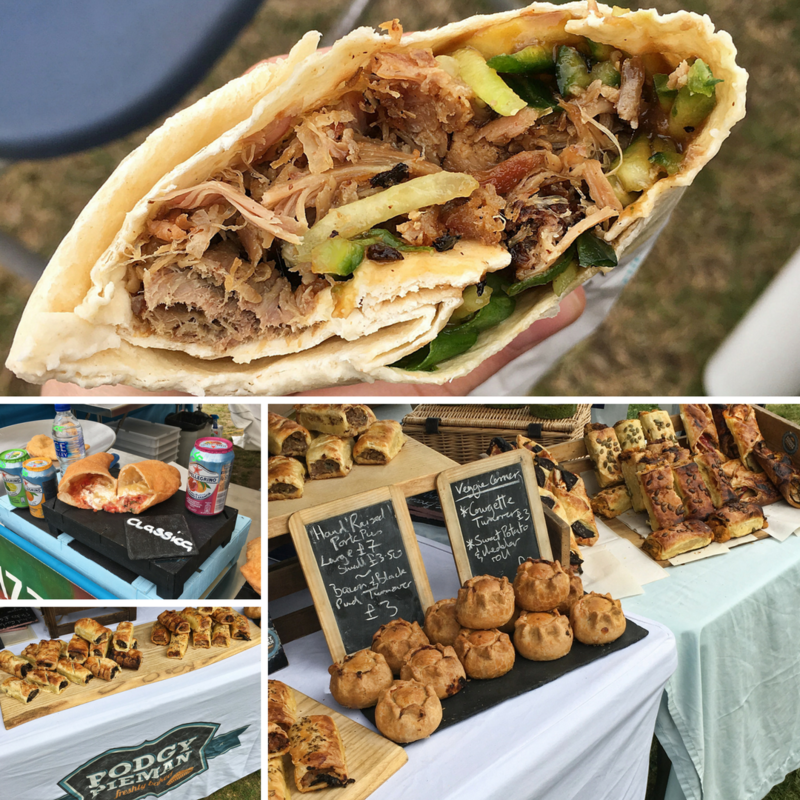 Being their second food festival I envisage they are still finding their feet, and the general consensus was there were a stack of food trucks but in terms of stalls to buy and take home it was pretty limited. If you are paying the full £9.00 general admission I bet you walked around thinking you’ve more or less paid to get in somewhere to buy a meal. Don’t get me wrong I bought a couple of bits but it didn’t feel like there was a great diversity on offer when I compare it to other food festivals, and looking at the booklet there were some stalls listed I swear I didn’t see. Good outing but definitely room for improvement. So here’s to the festival season, I can’t wait till the next one. What are you’re favourite festivals? Have you got any planned this year? I missed this event, but it does sound like that there wasn’t enough exciting things to purchase – shame. I like the Woking Food Festival where there are lots of stalls selling unique food and drink products, I think I still have my bottle of refresher vodka somewhere…..or maybe I drunk it ;0) Who Knows!! I must say though shame I missed the Flapjackery – cant beat a jolly good flapjack! I felt the same way about Foodies Festival at Tatton Park. I went to the first one they hosted there and thought the high entry price would mean there’d be lots to see, shop for and eat. I thought there was an okay amount of food trucks but there wasn’t enough by way of food shopping. At all. I was quite unimpressed but thankfully Tatton Park is a lovely place to visit and one of my favourites in the North West.